Despite a certain, enduring postmodern relativism and accompanying ennui, artists and art writers are still looking out for the truly new and the truly excellent. Often something is just too new to manifest its potential in considered or resilient form, and this has long been the case with what became known as ‘New Media.’ And so it has kicked around, irritating and nudging established aesthetic values, sure of its purpose in providing for our future but all-too-often carelessly deployed while exploited most enthusiastically for unprincipled commercial gain. 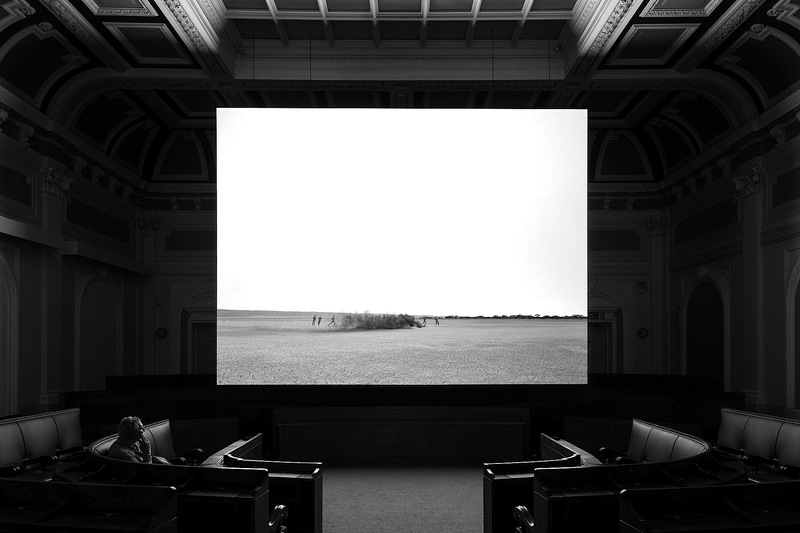 Until that is, an excellent artist like John Gerrard comes along to deploy New Media with the technical mastery of a first-rate oil painter allied to the conceptual and political savvy of the best critical artists. On top of all this you get sumptuous spectacle, as Gerrard’s works invite, and demand the highest available production values. Based on two previous Gerrard shows you’ve seen, he also has a penchant for transforming a site or environment with the scale of his work – in terms of both time and space. Much as you love the history of cinema, novels and theatre, it’s hard not to feel that Gerrard is pointing to entirely new kinds of narrative experience. 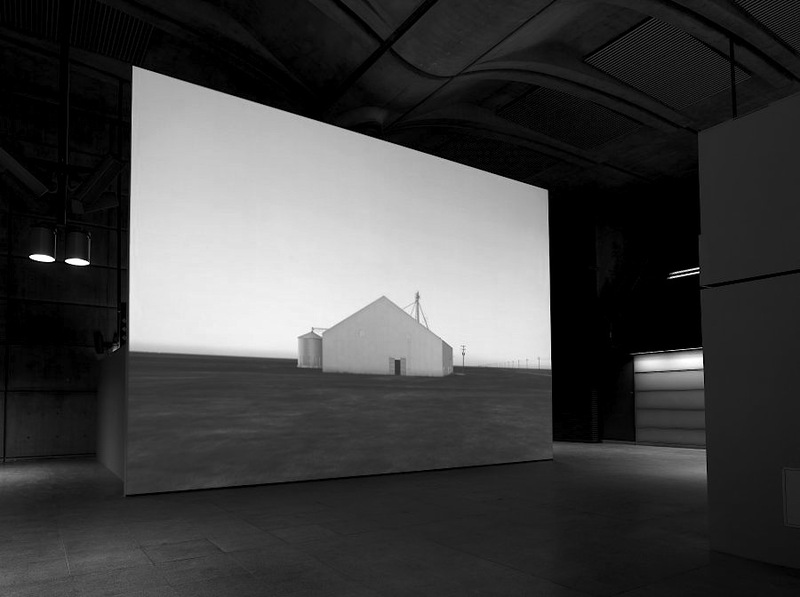 The greatly extended time-spans made possible by game technology (one of his works is 30 years long) and the possibility to compute unfolding image-time as cosmic real-time mean the work sometimes invokes a sense of aperspectival immanence as much as it might question a tradition of perspectival representation. Watching Gerrard’s video-game-based works you feel as though you are on a 21st century equivalent of a fairground ride, it doesn’t shock, bump and induce vertigo but connects you to the true disorientation of your life on a spinning, orbiting planet. New Media (video games, virtual reality, digital photography, Big Data etc.) have, almost by definition, their very own inhumane anti-aesthetic, and the look of New Media is probably a significant factor in keeping it marginal for a whole generation longer than might have been expected on its arrival. But any slight sense of repulsion or hilarity we might feel on encountering abandoned ‘2nd Life’ landscapes and awkwardly perambulating avatars has gradually been tamed and claimed as an increasingly serious part of the art world, as evidenced by the increasing stature of artists like Jon Rafman, Hito Steyerl, Travess Smalley and John Gerrard. Nevertheless, art’s relationship with New Media can sometimes slip into uncritically “awesome” territory, as human intelligence begins to bow, scrape and defer to the micro-god in the microprocessor, as when ‘Big Data’ experts trumpet the ‘creative’ achievements provided by algorithmically amassing the results of e.g. billions of tourist photographs. Then, artists of a certain age might wince and wonder when and where it was that glorified graphs and quantitative analysis became synonymous with art? At Thomas Dane’s gallery in Mayfair, a PV audience, well served with beer and wine, have gathered to witness the equally intoxicating spectacle of Solar Reserve (Tonopah, Nevada), [2014.] It ticks all the usual Gerrard boxes for scale, grandeur, fascination, precision and – perhaps the most beguiling of all Gerrard’s attributes – its conciliation of real-time cosmic motion with the gallery-grounded spectator’s experience. Thousands, or rather hundreds of thousands, of digital photographs are used in Gerrard’s works to feed into game technologies that use them to map and re-enact an in-the-round, real-time image of a given object in a specific location (often a building or zone in a desert or barren landscape.) 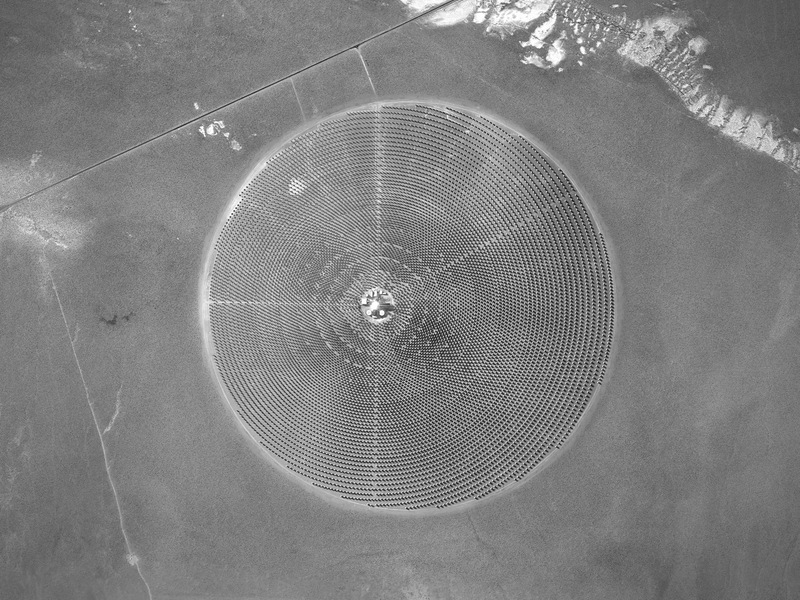 Here it is a spectacular solar power ‘farm’, with a central reflective pillar gleaming in relentlessly unmediated desert sunlight, encircled by a fractal-like organisation of slowly twisting mirrors. The subtly shifting, mandala-like form of the whole appears to follow the futuristic function of the apparatus. This is a work of art appropriate to our increasingly ‘live’, ‘online’ and climatically threatened environment, experienced by an audience who each carry GPS-guided, internet-connected devices in their pockets that never allow them to forget their status as citizens with cyber-identities constantly swayed by and held captive within a Tweeting, posting, uploading cloud of fellow global prosumers. Nevertheless, in art, human values die-hard. The two works of Gerrard you have previously seen (Oil Stick Work , and Exercise (Djibouti)  ) both featured figurative elements and perhaps it is their absence here that leaves you feeling as though Gerrard may have this time awed and overwhelmed you while denying you an all-important empathetic reference point, a body with which you might affectively relate, the 21st century equivalent of Charlie Chaplin caught up in the machine in Modern Times . It is possible of course for an excellent artist to ‘jump the shark’ – i.e. cross from a slightly innocent part of an ‘emerging’ career making great works precisely because you do not know quite what you are doing, into a realm of self-consciousness ‘establishment’ and relative hubris – and at Thomas Dane’s you worry for a moment that this may be happening to Gerrard. But then, all the signs of a painstakingly careful, creative intelligence operating within his work are enough to reassure you that he is unlikely to fall into such a career trap, and that the progress of art may -despite prolonged and profound reservations – therefore be safe in the hands of New Media after all. Posted on February 13, 2015 October 9, 2015 by pbpokane	Bookmark the permalink.